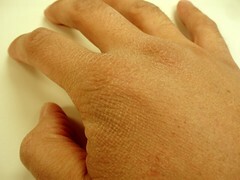 Here in Minnesota it has been a bad winter for dry skin. The temps have actually been higher than normal, but our drought in the fall and lack of snow on the ground has made for extra dry air. Our local newscast on WCCO featured some tips to help fight dry winter skin thanks to Dr. Rehana Ahmed. When it comes to moisturizing your skin, thicker is better. Dr. Ahmed recommends a cream rather than a lotion-based product. If your lotion is very liquid and dries quickly, it won't do the trick. Look for creams that contain ceramides, which adds lipids to the skin. Two products fitting that description are CeraVe moisturizing cream and Cetaphil Restoraderm. Does drinking more water help fight dry skin? Dr. Ahmed states it is a helpful addition, but you will still need a cream. To prevent dry skin, avoid taking very hot showers or baths or using harsh soaps. Doing so can strip moisture from the skin. When drying, don't rub your skin with your towel. Pay yourself dry and some of that shower moisture will seep into your skin. And how about your lips? Lip balms can limit the amount you lick your lips, so they are helpful as licking leads to dryness. Lastly, olive oil is a good natural moisturizer, but it may stain your clothes and you may walk around smelling like a dish of pasta all day!